a few weeks ago, my friends and i had a dinner out in one of a seafood restaurants near mangga dua square where dra, the finance manager, ordered "kepiting saus padang". of all the seafood selections people eat, crab is my least favorite one. not that i'm allergic to it, but because i'm too lazy to crack its hard skin and peel its meat out. until one day, i was invited to lunch with some people from queensland tourism in surfer's paradise. voila! a tasmanian king's crab to my choice of cooking was offered. 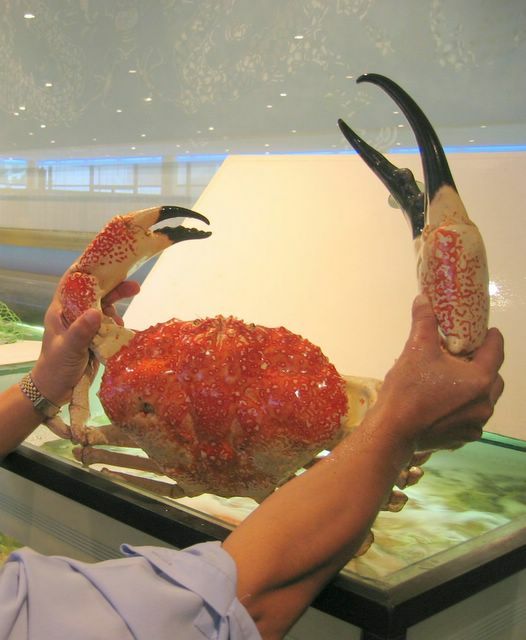 a crab so huge i've never seen before. and, before we knew it, it sat on a big plate in front of me. luckily, there were five of us enjoying this poor crab; otherwise, i didn't know what to do with this monster. kira-kira dijual gak ya di jakarta? just curious. An amazing crab for sure! I think you must be a "southern boy" at heart to miss Pumpkin pie, Waffle House and other southern treats! Iman, thanks alot for dropping by. Tulisane Iman juga asik! Bakalan sering ke sini, saya. Hahaha.. iya dulu aku di Sydney juga pernah makan kepiting segede itu. nelor pula. akhirnya dibikin 3 macem masakan dan telornya digoreng pake mi (this one was terribly awful, i prefer to eat the egg with sambel terasi and hot steamed rice). for me: kepiting = allergic. how come we never meet up again after that first and last time in citos? kutunggu janjimu... hehehe.. kalo ada acara yang asik2 ajak2 dong.. i need to broaden my circle of friends nih.. hehehhe..